A hilarious and crafty blog. A co-worker just alerted me to the website This Is Why You’re Fat. 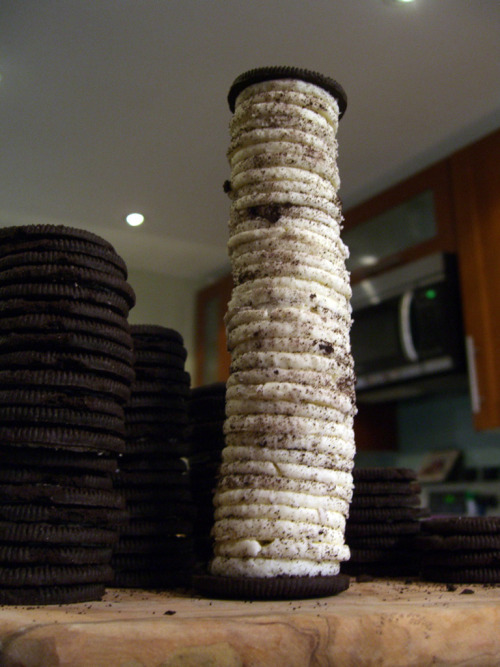 I don’t know why it never occurred to me to do that with a box of Oreos; I think the most I ever put together between two ends of a cookie were three lard centers. That stuff is so delicious! Pasta, particularly with butter (or I Can’t Believe It’s Not Butter, which I can believe is not butter but still love the taste of) and a lot a lot a lot of cheese. Baking, especially when it involves frosting. Or batter. Or dough. Or anything edible. Bread. I cannot resist a good bread basket, equally a fan of olive oil and salt on top as butter, and I just love a cheese plate that allows me another opportunity to slather brie onto a thinly sliced baguette. Chipotle. There was a period of time in grad school, during the semester when I was teaching, that I ate a Chiptole fajita burrito multiple times a week. I don’t know how I ever got myself to stop doing that. Or why. Street meat. Those of you not lucky enough to live in a city that serves up street meat on nearly ever corner, I pity you. I think in an ideal world, I would alternate between Chipotle and chicken-over-rice from the plaza near work for lunch every day, and I’d have pasta with bread and cheese for dinner. Is that gross? I’d also find the time to bake every single day. As for the first item on my list, we all know how much I love pasta. I should do a better job of defending this much-maligned staple of my diet. It started with Atkins, which had a snowball effect of many more low-carb and even no-carb diets. Those diets are ridiculous, and here is why. One summer during college, or perhaps right before college, I spent a month or so at home. All I did, all day long, was sew and watch movies. I would emerge from the basement a couple of times a day to have a big bowl of plain pasta with butter and cheese, and I would retire to bed as my parents were waking up, usually around 6 in the morning. A few things happened: I made a lot of dresses, most of which I never wore (and I even made one for Croquette, which she probably never wore, either). My dad took back his credit card, which he’d given me to rent movies with, when he discovered I’d rented more than 100 movies in a few weeks’ time. I also lost 15 pounds. It was the best diet ever.